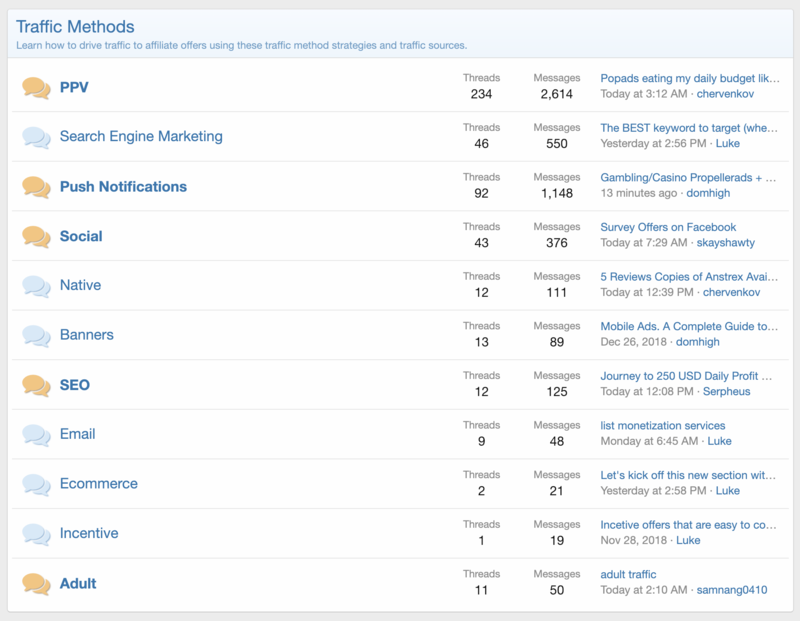 We have forums for all major affiliate marketing traffic methods on affLIFT! Affiliate marketing is complicated, but choosing a traffic method to use to promote an affiliate offer shouldn't be. 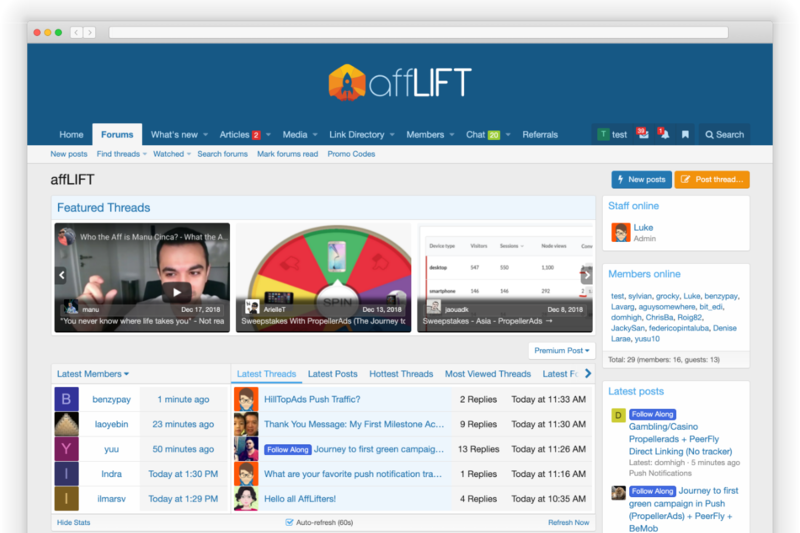 We have forums setup within affLIFT for every major traffic method currently being used by affiliates. The most popular traffic methods currently being discussed within affLIFT are PPV, Push Notifications, Search, and Social. PPV marketing is a method that has been used by affiliates since affiliate marketing came into existence. The main types of PPV marketing are pops (pop-ups and pop-unders) as well as domain redirects. PPV is a really popular traffic method on affLIFT because it is very newbie friendly. Setting up a PPV campaign is pretty simple and most of the money is made by learning how to optimize (which is covered in-depth in the forum). Push notification traffic is growing in popularity among affiliate marketers and affLIFT is ahead of the curve when it comes to providing great information on running push notification affiliate campaigns. Our push notification forum has grown tremendously over the past few months and continues to feature amazing Follow Along campaigns, video guides, and case studies showing how to run a successful push notification ad campaign. We have quite a bit of discussion around search engine marketing on affLIFT as well. Most of the discussion is around running affiliate campaigns on Bing Ads, but we also have some discussions around SEO with affiliate marketing as well as some search engine marketing tools. Search marketing can be great for affiliates of all levels and we have the guides to help you take your campaigns to the next level! Want to finally figure out how to create a Facebook Ads campaign with an affiliate offer that actually gets approved and is profitable? We have some fantastic discussions around different types of social media marketing and channels available for you to test with your affiliate marketing campaigns. We also have some great discussions around growing a social media audience on Facebook using Facebook Pages and a giant Twitter following. Join the forum today and get your social media marketing questions answered. Did you know we have a chatroom for affiliates?